ELeather, a UK based environmentally friendly materials technology company will be showing the rail industry the future of transportation seating at Middle East Rail, Dubai on 7th and 8th March 2017. This will be the first year for the clean technology company at the show, and rail sector manager, Alexandra Bennett, is keen to demonstrate the company’s strong belief in ‘seeing transport the passenger’s way’ on their stand – C2. According to research carried out by Frost & Sullivan, the rail market in the Middle East is due to double in size by 2023, making it a huge opportunity for the industry and one that manufacturers need to be ready to address. 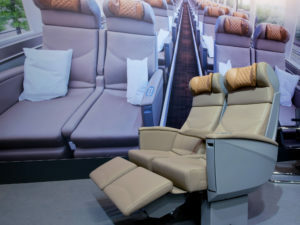 Increased demand in passenger transport will drive operators to take careful consideration over their seating and interiors to ensure they’re offering the best possible service to passengers while ensuring manufacturing and operating costs are kept efficient. The future of public transport is heading towards a much more integrated approach, with passengers using multiple forms of transport within one journey to reach their destination. ELeather are uniquely positioned to support operators and seating manufacturers with a high-performance leather fibre composite that offers a premium quality seating product with the appearance and feel of traditional leather, while achieving the consistency and performance attributes of a man-made, engineered material. This together with a wide range of colours and grains allows seat builders and designers consistent quality and flexibility in design. Operators can maximise their brand while providing a premium service to customers and the product’s high performance attributes reduce costs associated with maintenance and cleaning. Alexandra will also be sharing her ambitions for passenger transport through a seminar being held on day two at 14.30 in the Infrastructure Demonstration Theatre. ELeather products are designed and manufactured to provide exceptional characteristics delivering an eco-friendly material that out-performs traditional leather, synthetic leathers and fabrics. Using the process of hydroentanglement we combine traditional leather fibers and high performance core material to produce eco-engineered leather fiber composition upholstery. The clean technology product uses 100% zero carbon electricity in its production process, as well as recycling 95% of the process water, and converting the waste streams into energy which is fed back into the process. Visit stand C2 to see how operators can enhance the passenger journey!